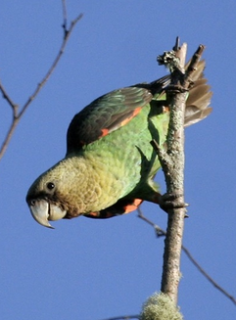 The Cape Parrot (Poicephalus robustus) has undergone a population collapse over the last 50 – 100 years as a result of forest loss, trade and disease. Progress and outcomes: Beginning in the mid-1990s WPT has supported a number of projects to help save the Cape Parrot. Since then there has been work to restore habitat, assist wild breeding, and study population and disease. Local communities have become involved in caring for the critical Afromontane forests that are vital to the survival of the parrots. surveys of key sites, the project aims to track population trends, and understand the drivers of seasonal movements and the interplay between Capes and other species. Nesting sites have been identified and efforts are being expanded to study areas further afield. An outreach program has involved 100 school-age children in activities and games both inside and outside of the classroom. With your help we can better understand the Cape Parrot and continue to work towards effective solutions to further their conservation. Where found: Endemic to the Republic of South Africa, extending from the Amathole and Transkei regions, to southern KwaZulu-Natal, and an isolated forest in the Limpopo Province. History: Cape Parrots are recognized as critically endangered in South Africa, having undergone a population collapse over the last 50 – 100 years. The global Cape Parrot population is split equally between two separate populations in the Eastern Cape and KwaZulu-Natal, with an additional isolated group of approximately 30 parrots living in the Woodbush-Wolkberg forests, Limpopo Province. Over 300 years of unsustainable logging of yellowwood trees from the Afromontane mistbelt forest of South Africa has left only remnant forest patches. They are also threatened by capture for the wild-caught bird trade and disease (specifically Psittacine Beak and Feather Disease (PFBD). Ecology: This species prefers high altitude Afromontane mistbelt mixed Podocarpus forest patches above 1,400m (4,200ft) and lowland/coastal forest during feeding forays. Birds feed on Podocarpus fruits, and on a variety of seeds from different tree species. They have also been recorded feeding on introduced food resources such as apples, plums, cherries, acorns, pine seeds, and Eucalyptus flowers. Birds roost communally in flocks of up to 10 parrots in large Eucalyptus or Podocarpus trees. The Cape Parrot travels vast distances (up to 100km) to preferred feeding sites, often staying for weeks to exploit this food resource. They are shy and easily disturbed when feeding.